When discussing the VP in other topics I was wondering what kind of real demand there would be for such a prop. I would have thought there wouldn't be demand but according to a couple of people there might be. I cannot speak in any way for the propmaker but as a hypothetical excercise would people be still be interested in the VP even after other high end Vaders turning up since then. I think the reason things were so stop start was because at the time I didn't know many real Vader fans and also it was just a faceplate offered not a complete helmet. Would people just want the faceplate or would they also want the ESB / ROTJ style dome as well even though they were not a matching pair. Please remember this is purely hypothetical excercise. It would also be a good way of gauging the expectaions of what the Vader community are interested in at the moment as the bar is constantly being raised at the moment. I would appreciate any constructive input from the forum members. Last edited by voice in the crowd on Mon Aug 18, 2008 10:41 pm, edited 2 times in total. I'd be down for one definitely. I'd just want the faceplate, though. I think it's an exceptional faceplate and would be a great base for whichever route you go (ANH, ESB or ROTJ). As far as pricing? Well, I think in the price range of $300-$400 would be acceptable, but that's just what I'd be willing to pay. I can't speak for the rest of the clan. Thanks for the consideration Chris. Judging by a few PMs I would like to stress this is a hypothetical excercise. I suppose it is trying to gauge is the VP as relevant to the Vader community as it would have been 3 years ago or has it been completely surpassed? There have been some great Vaders introduced to the community and possibly more to come. Judging by a few PMs people have got the wrong end of the stick this isn't an offer of VPs in any way. I have edited my first post to hopefully reflect this. I can see why my first post would look like an interest thread before editing so apologies if it was taken the wrong way. This isn't market research more curiousity to the communities thoughts on an ever changing collectors market. I've always been a big fan of the VP. I'm with Karo on the price. I'd be insanely curious to see the dome. Just the faceplate is what I would be the most interested in but I wouldnt say no to the helmet. Understood Chris, but color me interested regardless. I think the VP is just another fine example of what we all love. Even with it's moderate cleanup, it's still quite a beauty. It still has the "look" and I'm sure you have already seen a great demand for it judging by your posts. The way I see it, the VP has the correct structure and shape. The fact that it's cleaned up of its surface textures is not a showstopper. Some people may prefer the clean look like you see on the DJ. Those who want to hand paint it and add texture, the VP would be an awesome candidate. I realize in some recent threads and posts that the VP has been made lower in importance because of its lack of surface detail. Honestly, the people who care about surface detail is such a minority that I must say the weight of importance should be in making sure a mask has the right look and shape. 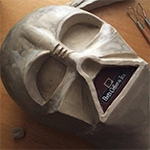 Its a great mask, I think a person would have to be nuts not to want one. A great mask indeed, I remember I made enquiries at the time. I'd still be interested. Hey, if any of you VP owners might feel inclined, do consider some indoor acrylic paints (that specifically wash off with warm water and soap). It would give you a chance to see what it could look like with an ANH style paint job. Sometimes just regarding an all-black mask makes it difficult to visualize its potential. Interested. I'm with Mac, I'd really like to see one of these painted up too. I'd be interested in a facemask as well. I would love to see what a hand painted texture paint job could do to the look. Not bad for a Photoshop but that is still mostly the screen used superimposed over the SL. We're not seeing the real SL.